Wow what an awesome shot! I'm going to try this this week! Gosh! There are so many cool things to see in NY. I was there for a week and it ended up being all about business. I did get a chance to walk around in Battery Park. I have to take some time and go through the pictures. Lovely. 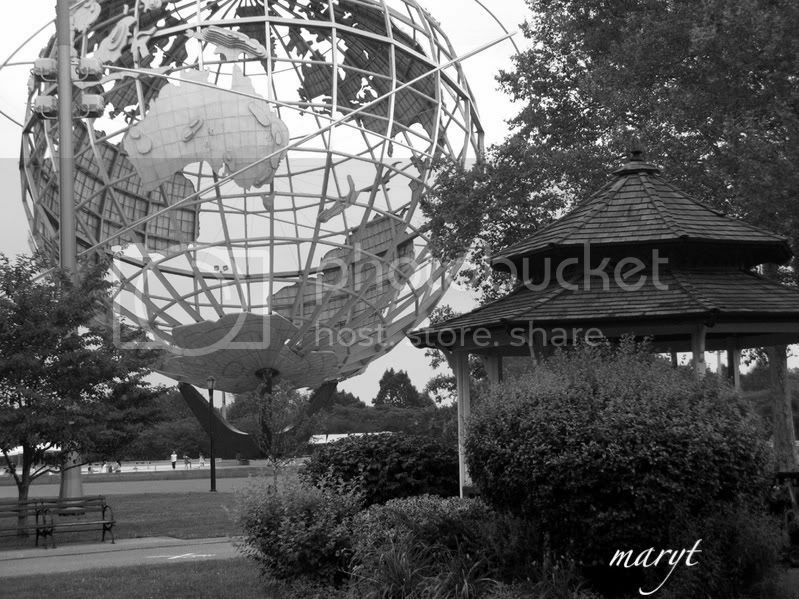 Whenever I see pictures of The World's Fair it makes me think of pictures of my parents. I have tons of them standing in front of that globe. I should do some scanning this week. the pagoda is such a contrast to the the globe!! This is incredible! Like a fantasy world! And as I am Australian, love the feature of Australia there on the globe! This is a great shot, Mary. Never heard of Monochrome Monday. I went to the World's Fair. Yikes that was a long time ago. I had not realised that you had posted. It is a good shot.